If you have to print a lot and to make copies in monochrome mode we offer you to buy Epson M200. This device from "Epson Print Factory" will be a good assistant for you and will make qualitative prints for a low cost. The printer will fulfill any print job and the quality will be excellent. This printer is rather economical to use. 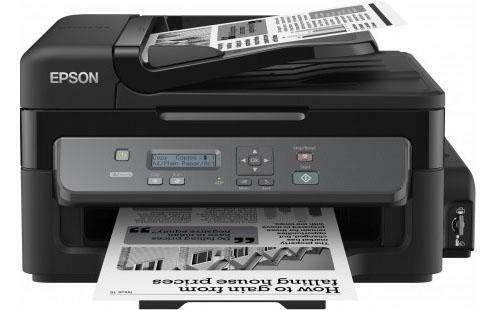 Epson M200 is meant for printing different black-and-white documents and it cannot print photos and other color images. The printer in question has a new design. Due to the built-in ink reservoirs the price of printed documents is really low. The approximate price of the printer will be $ 220. If you are interested in economical and inexpensive printing, such model as Epson M105 will fit you. It will suit any up-to-date design and will be of use in any office. This multifunctional device has Wi-Fi connection, that is why you can put it everywhere you want and it will be available from any place of your office. There are two reservoirs with pigment ink in a set. Their capacity is 140 ml. Due to this start ink set you will be able to make up to 11,000 prints. Thanks to the availability of CISS you don't have to waste extra money and time in buying cartridges. The ink reservoirs are fitted with ink locking system, due to which you can transport this printer easily. The main merits of MFP Epson M200 are its high operation speed and low cost of prints. These are its distinguishing features in comparison to other printers. Epson M200, price is reasonable and even users with low income can afford it. Nevertheless, it is a reliable device and it will surprise you with rather wide range of functions. This device supports Epson iPrint apps, due to which you can make prints from any mobile device with iOS and Android. Moreover, it can be connected via Ethernet. This MFD is very convenient in service because of its large double-line LCD screen. The automatic feeder for documents is very handy; it provides comfortable and convenient operational process. Epson L110 is another really good assistant, offered by "Epson Print Factory". It will help you in everyday work and due to it you will be able to make savings. So, you has got acquainted with Epson M200 with built-in Continuous Ink Supply System, due to which a qualitative black-and-white printing at a reasonable price became accessible.